Okay you've got your ninja star collection, you've learned how to throw them now what do you do to keep them in tip top shape and maintain their edge. 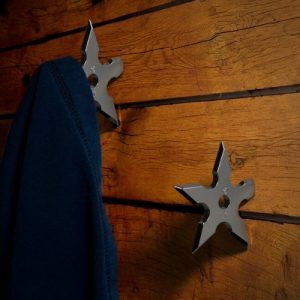 Unless you are a shuriken master you will invariably miss your target at some point and this often will leave dirt and grime on your stars. Simply you can wipe them off with a towel lightly moistened with water or isopropyl alchohol. Make sure to dry them completely as they are made of metal, stainless or not they could eventually rust. Check the edges and if nicked or otherwise dulled you can go ahead and sharpen them with a stone (see below). Otherwise you can put a little 3 in 1 oil, WD-40, sewing machine oil or another lubricant on them to keep them as good as new. If you use an oil based product just be sure and wipe them off before your next throwing session. You don't want your throwing stars slipping out of your hand and puncturing you, your brother or any other living being. After some use your ninja stars are going to eventually dull. Not to worry, with a little time and elbow grease you can get them back to their original state or even sharper depending on the star. Do not under any circumstances use a grinder on your throwing stars! You have been warned. About 30-40 strokes at about a 20-25 degree angle with a sharpening stone will do the trick. We recommend this quality whetstone kit for sharpening your ninja stars. There is a course stone to start your sharpening and a fine stone to hone it to a fine edge. Its relatively inexpensive and works great for a variety of weapons and knives you have lying around the house. There are a lot of options out there and many of them will work just fine. For most a slightly application of 3 and 1 oil will help in the process. When finished with the sharpening stone clean your star as above and rinse off the sharpening stone as well and dry completely.